48 registered members (Billbert, A1O, billt460, bbhero, Bailes1992, 7 invisible), 669 guests, and 27 spiders. Given Mercedes petrol engines have a reputation for premature wear on the timing chain drive would you risk using a low saps oil when you don't need to. Are the anti wear additives in low saps oil as good as full saps. I suppose they could be even better. Going to view this thread with interest. The oil specs for our Smart are rather vague, just the Merc Spec. Why would low saps oils have even better anti-wear additives? If you have an older vehicle without the modern enissions equipment that low saps was specifically designed for then what would be the advantage to running a low saps? Lol...I guess you are asking why low saps would be better and I am asking why you assume low saps would be better. Every bit of research I have done urges to avoid low saps oils in cars that do not require them. This would require scrutiny form a chemical engineer. Traditionally, UOA's from low-SAPS oils don't look good at all. That's why the change interval recommendation is usually less miles. Instinctively I don't think low saps is better, just trying to keep an open mind. Part of me say 229.51 must meet the same M 271 Wear Test (MB DL, Wear, 250 h) but I just want to know if the low saps anti wear additives are in any way a compromise. It wouldn't matter if MB built engines with sound cam chain drives but they don't and they are not alone in that. I know oil shouldn't be the answer to poor engine design but it is what it is and I want to use the best oil to mitigate any potential problems. Typically, the compromise is cost. Yeah, basically for MB, it's 229.5 for gassers and 229.51 or 229.52 for diesel. They don't really seem to have any chain problems on their V6 engines so it's not really a concern. Don't know about their other engines. Lots of people here change their oil at 5k instead of waiting for the recommended 10k. Lots of people here change their oil at 5k instead of waiting for the recommended 10k. Yes I'm also changing the oil at 5K which seems wasteful but may be cheap insurance. It's interesting that when I read about cam chain failures the car always seems to have a full Mercedes service history which would be anything up to 15K intervals. It may just be a design defect and have nothing to do with the oil. On the 2006-2007 E-350's here, the balance shafts would fail, but that part was updated and had nothing to do with what oil was run. Here the service interval is now every 10k or one year, used to be 13k but I guess people don't like to run their oil that long when they used to change it every 3k on conventional. My E-350 uses 8.5 quarts so the oil isn't really used up even at 10k. Still, I end up changing it around 8-9k but occasionally let it go to almost 10k when I can't get around to it. I just have too much $2/quart oil from Autozone so I'm doing slightly more frequent oil changes. 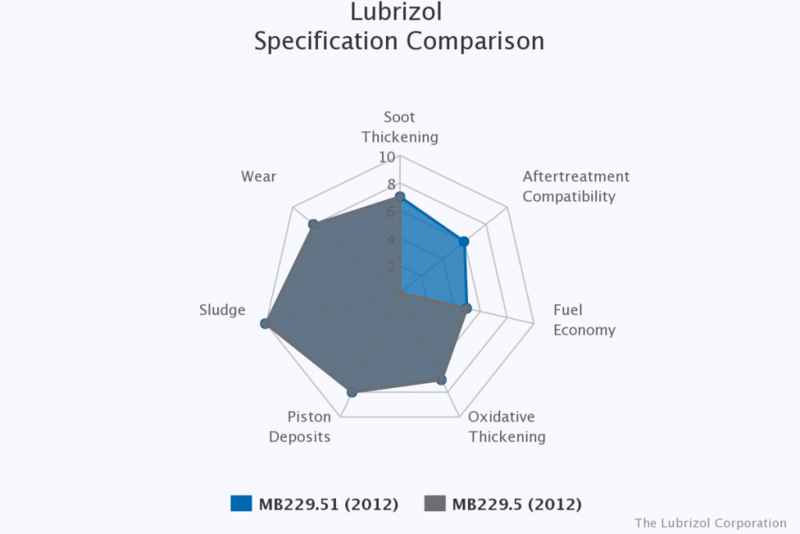 According to this Lubrizol chart, only difference is aftertreament compatability for diesel engines.